Countries around the world and USA and individual state. Available in French and Spanish. Excellent background information about the why and where of dress. Visit the web site of the Newberry Library in Chicago to view selections from a special exhibit on Marie Antoinette. You will learn more than just facts and dates about the famous queen of France. You will also learn about her influence on fashion, music, and dance. Each piece from the exhibit is accompanied by printed information about its importance to Marie Antoinette. You will see examples of the extravagant hairstyles of the time and learn of Marie's inspiration for musical compositions and dances. You will follow the queen as she is taken prisoner during the Revolution. Aiming for truthful objectivity, French realism focused on contemporary life in the aftermath of the revolution. Gone were the idealized, historical, and unusual images of classicism and romanticism. Realism depicted the gritty details of the everyday lives of the working class in a time when the people were fighting for democratic reform. Some saw these images as anti-authoritarian or politically subversive. The monumental scale used for images of humble people had previously only been used for historical paintings. Breaking those conventions challenged class distinctions. The historic role of Joan of Arc, a fifteenth century visionary and military leader in the hundred years of conflict between France and England, is discussed in this biographical essay from the “Collective Biographies of Women” Events in the life of the young woman, who was born on a farm in northern France in 1412 and would die a national heroine, include strategic victories over the English armies that Joan claimed were the result of divine guidance. A bibliography and black and white drawings of Joan of Arc are also featured. The Congo Page is a collection of resources that is being shared with you by The African Studies Center from the University of Pennsylvania. The resources are web sites that contain information about the Congo. There are links to maps, travel information, articles, African indexes, governmental issues, energy information, descriptions of languages, national parks, news, and official sites as well. This is a great place to search for reliable information on Congo from a credible source. From the African Studies Department at the University of Pennsylvania, this page provides many links to Senegal related topics. Upon arriving at this page, the viewer is met with a small illustration of the Senegal flag, links to a country and capital map, travel advisories, the Sengal Embassy in the U.S., and the World Factbook site on Sengal. Many links to other on-line resources pertaining to Senegal follow. One may explore the languages of Sengal, the governments, the businesses, the cultures and much more, including the birds of the country. From the African Studies Department at the University of Pennsylvania, this page provides many links to Niger related topics. Upon arriving at this page, the viewer is met with a small illustration of the Niger flag, links to a country map, travel advisories, the Niger Embassy in the U.S., the World Factbook site on Niger, and officialdocuments on Niger. Many links to other on-line resources pertaining to Niger follow. One may explore the languages of Niger, the current news, World Bank projects, biological diversity and more, including bird stamps. The Gabon Page is filled with helpful resources that offer a wide variety of information on the country of Gabon. This is a convenient way to research since all of the links to sites are located on one page. The types of sites you will encounter offer information on Gabon's geography, government, current events, energy sources, languages, and its law. 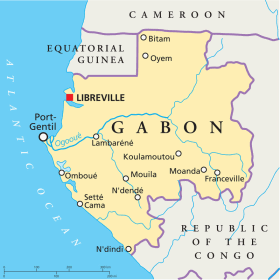 There are also sites that provide multiple categories of facts and information related to Gabon. This Africa Guide site will give you a lot of basic information about traveling to Gabon. You can see a map and an illustration of the country's flag. The temperature stays at about 80 degrees all year round, and the country gets between 100 and 150 inches of rain every year. If you plan a trip to Gabon, you should look at the Latest Travel Advice and Visas and Immigration sections. There are several public and religious holidays listed plus a link to the current exchange rate.